Back in June, The Roots and Jimmy Fallon taught us all that we actually love “Call Me Maybe,” especially if it’s played on classroom instruments. 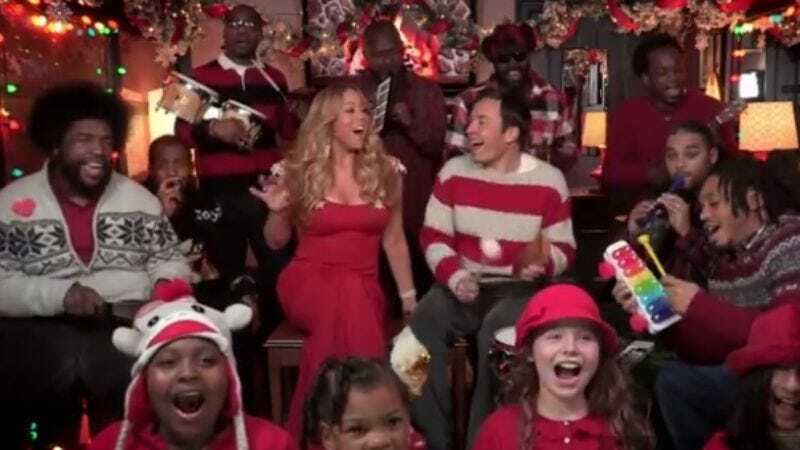 Well, they return today to teach us a valuable holiday lesson: It is in fact possible to improve upon what is arguably the best original Christmas pop song of the last 20 years, Mariah Carey’s “All I Want For Christmas Is You,” given the right performance. (Sorry, kid from Love, Actually, this wins.) Christmas-sweater-clad ?uestlove and Co. bust out the xylophone, melodica, and shakers, a choir of adorable moppets pop up to provide the holiday-mandated choral accompaniment, and Miss Mariah herself arrives (spectacularly overdressed, of course) to contribute her signature dog whistle to the mix. It’s a perfect cure for a case of the bah-humbugs, and a reaffirmation that—like mega-popular bubblegum pop singles—not all holiday music has to be awful. In fact, it can be pretty great.